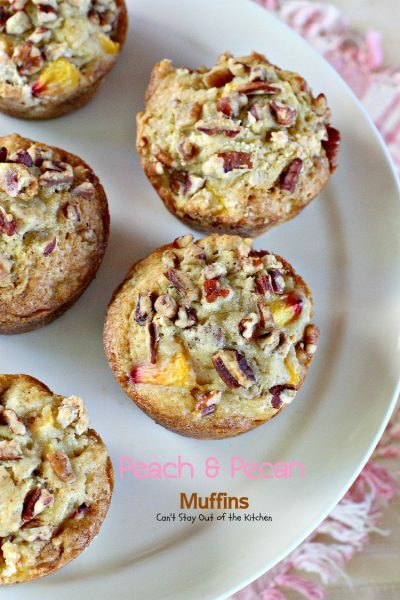 Peach and Pecan Muffins are absolutely lovely. Okay, I admit that I love muffins. Actually I like them even better than cupcakes because I enjoy the denser texture (although cupcakes certainly have their place!). 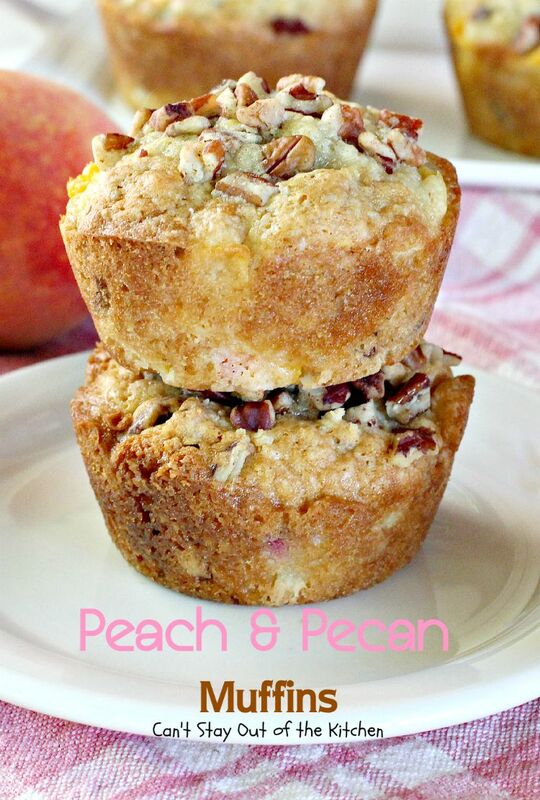 Peach and Pecan Muffins have lovely texture due to the peaches and pecans in the batter, but they also have sour cream so they stay moist and delicious. I was concocting recipes on the fly last month when our peaches were coming in and this was one of those delicious recipes I whipped up to try to use all that fruit. I ended up giving them out as samples to several people who were at the house that day and without exception, everyone loved them! 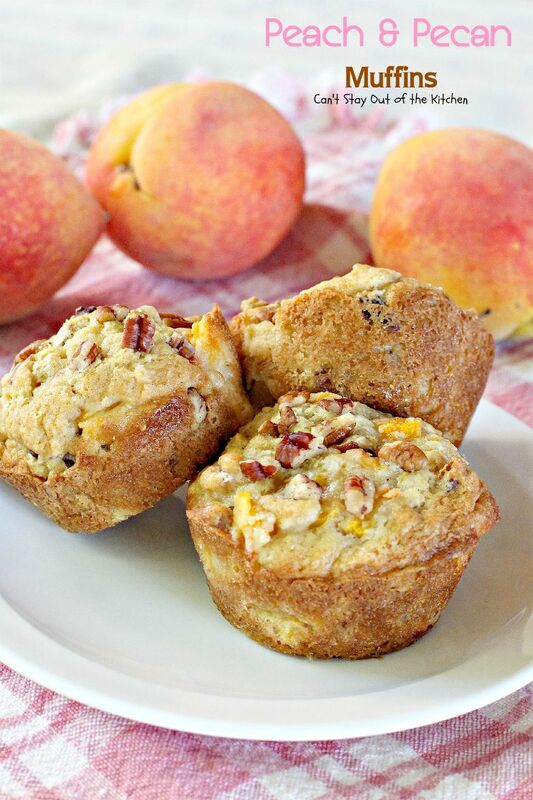 The nice thing about Peach and Pecan Muffins is they’re really simple to make–especially if you buy really large freestone peaches. It won’t take too many of those extra large peaches to get the amount needed for these muffins. A couple of suggestions when making muffins….don’t overstir your batter. That will cause the muffins to toughen up. 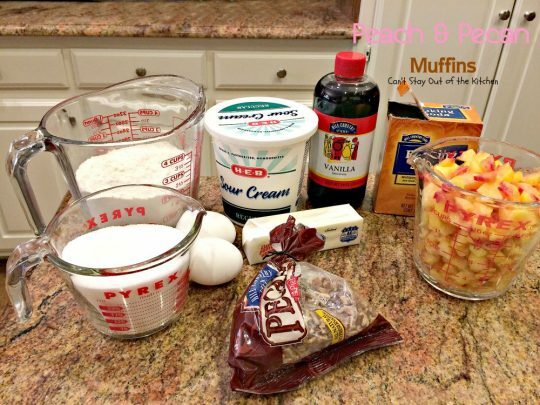 Also, start the muffins at a very high temperature – 425! Bake 5 minutes at 425 to get the batter to raise, and then turn the oven down to 350 for the remaining baking time – usually 15-20 more minutes. The muffins will usually puff up nicely and not fall flat, like they may if you keep a steady 350 temperature. Peach and Pecan Muffins are delightful for a summer breakfast. Adding pecans on top of the batter provides a nice crunch to the muffins. 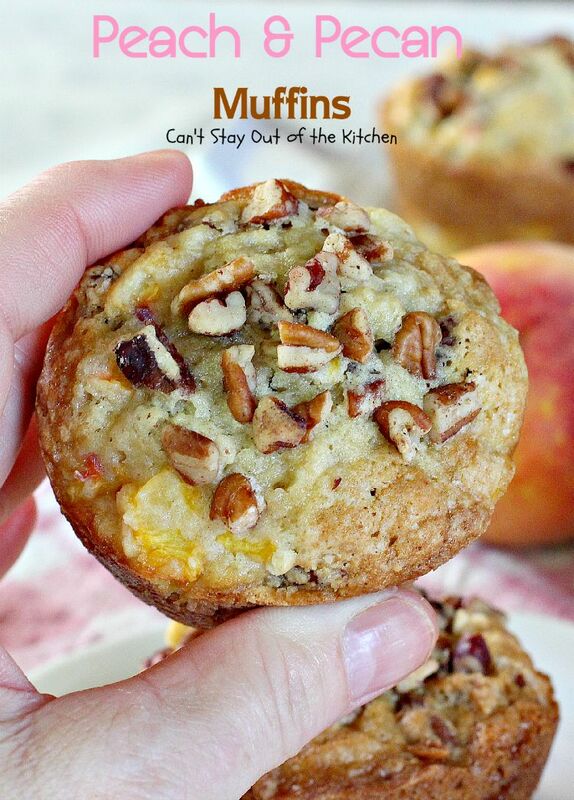 Peach and Pecan Muffins are a great way to use up overripe peaches! Place softened butter in a mixing bowl. Add sugar, eggs, sour cream, baking soda and vanilla. Add UNBLEACHED all-purpose flour, peaches and pecans and stir just until moistened. 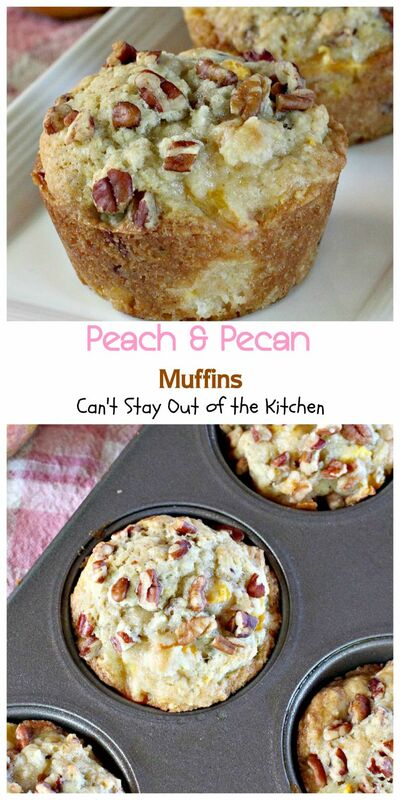 Spray muffin tins with cooking spray. Scoop muffin batter into prepared tins and top with a couple of tablespoonfuls of chopped pecans. Press pecans into batter slightly. Bake muffins for 5 minutes at 425. Reduce heat to 350 and bake an additional 15-19 minutes or until a toothpick inserted in center comes out clean. 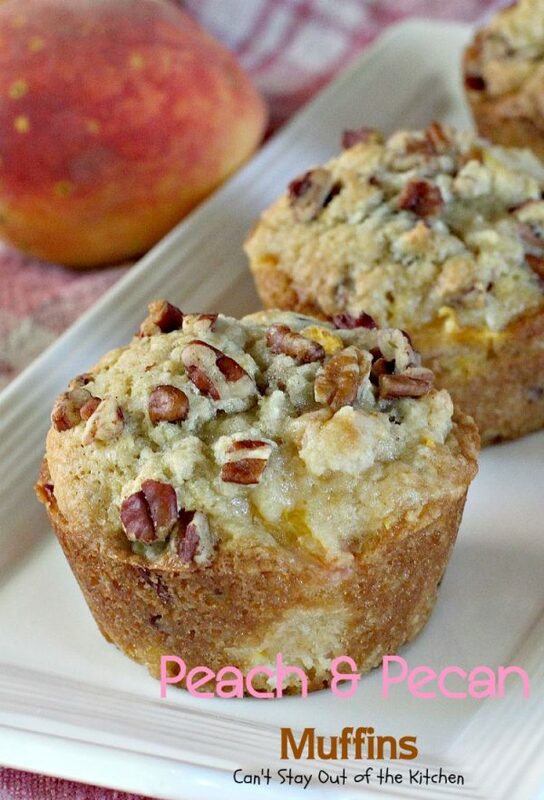 Peach and Pecan Muffins are very simple to make but have delicious flavor. I made these ones without cinnamon so that the peaches were the strongest flavoring in the muffin. 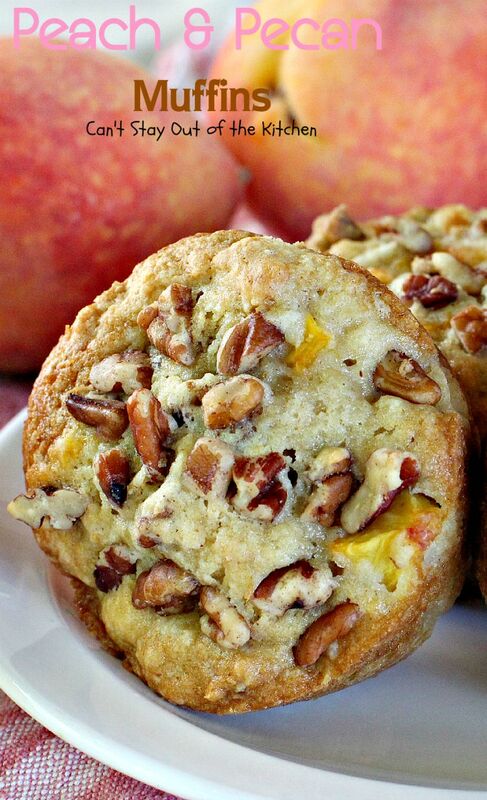 Serve Peach and Pecan Muffins for breakfast or dessert! 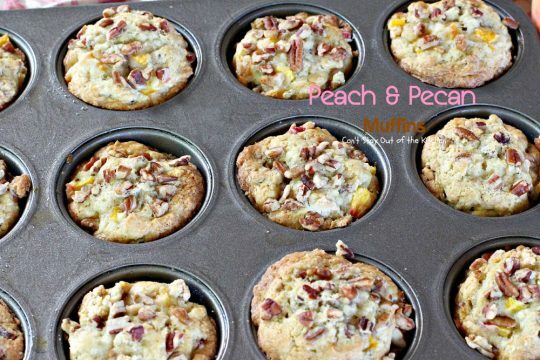 These lovely muffins are filled with peaches and pecans for great texture and sour cream makes these muffins moist. 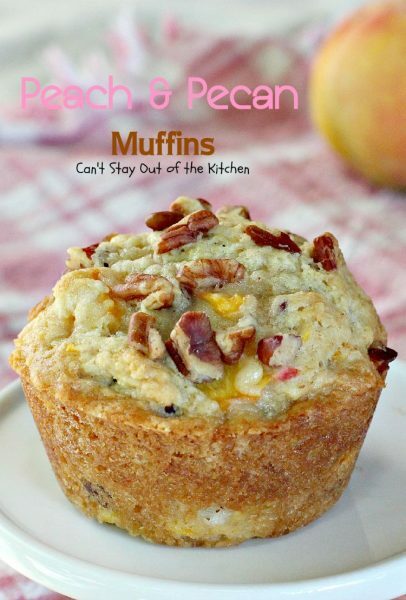 Great for summer breakfasts. 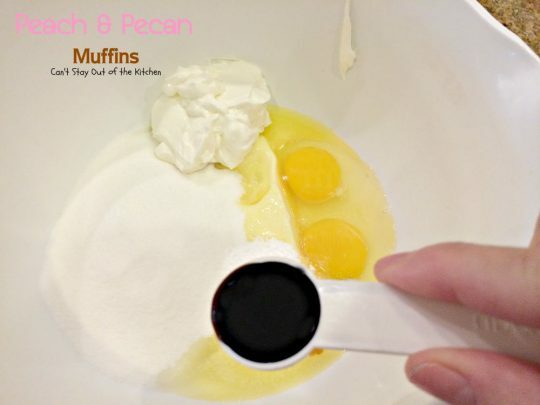 Mix sugar, baking soda, vanilla, sour cream, eggs and butter in a large mixing bowl with an electric mixer until smooth. 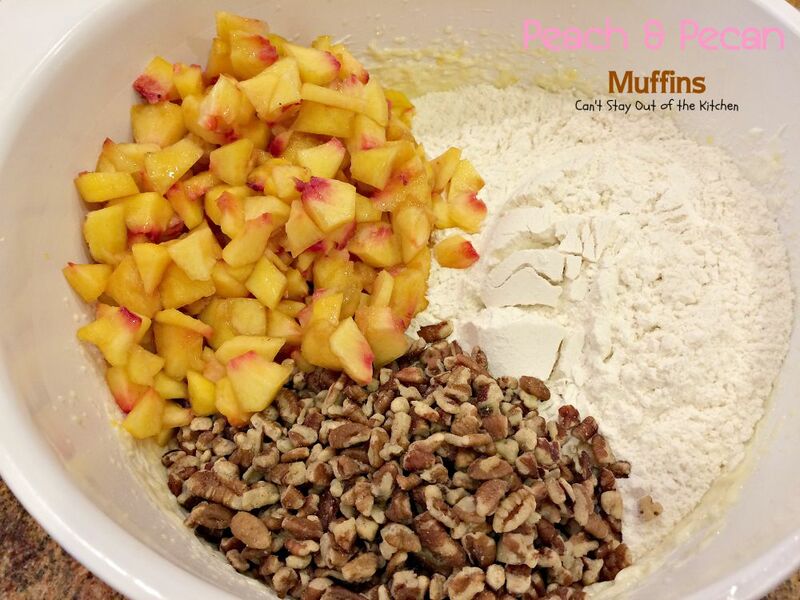 Add flour, peaches and pecans. Spoon muffin batter into greased or sprayed muffin tins until almost full. 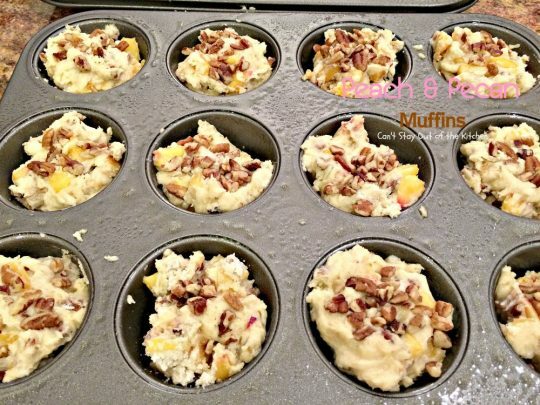 Sprinkle more chopped pecans over top of each muffin in pans. Press pecans slightly into batter. Bake in a preheated 425° oven for 5 minutes. Bake at 350° for 15-20 minutes or until a toothpick inserted in center comes out clean. NOTE: The secret to having muffins that raise perfectly every time is to start the baking at a high temperature (425°), and then lower the temperature to 350° after 5 minutes. This allows the muffins to raise properly. If you bake muffins at a steady 350° for the whole length of baking time, they will usually be flat on top. The secret to having muffins that raise perfectly every time is to start the baking at a high temperature (425°), and then lower the temperature to 350° after 5 minutes. This allows the muffins to raise properly. If you bake muffins at a steady 350° for the whole length of baking time, they will usually be flat on top. These are so easy to make up, you’ll want to make them often! Peach and Pecan Muffins are great to take to any brunch, baby shower or other potluck function. These look delicious, Teresa! I love the addition of nuts to the top and the sour cream in the batter. Also, thanks for that tip about the oven temperature. I had noticed several recipes I saw lately did that, but I didn’t know the reason behind it. I always love learning about baking and why ingredients do what they do. I hope you have had a good summer! Thanks, Shari. 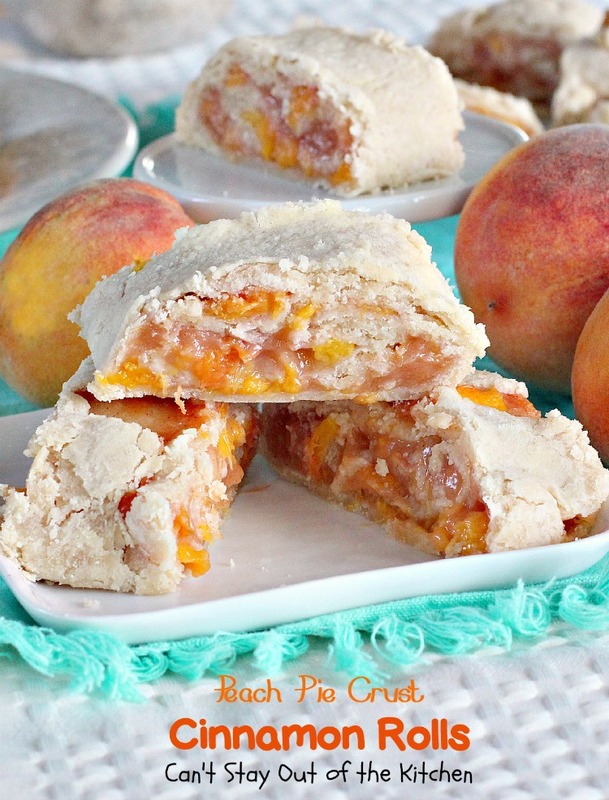 I know I’m kind of on a peach roll now. The higher temperature kind of makes the recipe pop (along with using 1-2 tsp. baking powder). The lower temperature sets it. We’ve had a great summer – but super busy since we’ve moved and the earlier part we were showing the house several times a week.